Definition at line 37 of file CKinFunction.h. Definition at line 38 of file CKinFunction.cpp. Definition at line 45 of file CKinFunction.cpp. 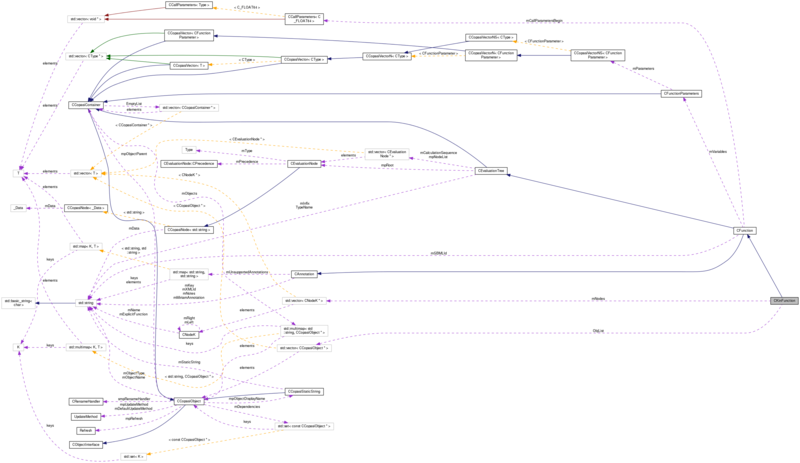 References C_INT32, cleanupNodes(), CONSTRUCTOR_TRACE, createParameters(), CReadConfig::getVariable(), and mNodes. Definition at line 72 of file CKinFunction.cpp. Definition at line 80 of file CKinFunction.cpp. References cleanup(), DESTRUCTOR_TRACE, and ObjList. Definition at line 91 of file CKinFunction.cpp. Definition at line 248 of file CKinFunction.cpp. Referenced by CKinFunction(), and cleanup(). This function indentify the object from name This connects the nodes to build the binary function tree This function is part of the algorithm that builds the binary tree. The expression to the right of the current node (mNidx) is parsed until an operand with a left priority <= the argument (right priority) is encounterd. The pointer to the top node of the parsed expression is returned. CNodeK * This function is part of the algorithm that builds the binary tree. It returns a pointer to next primary node. Here next is with repect to the internal counter mNidx. If the node is a dead end, i.e., any contant a pointer the node is returned. If then node is '(' the expression between the node and the matching ')' is parsed and a pointer to the resulting top node is returned. If the node is a function or a unary minus the argument is parsed and a pointer to the function node is returned. Definition at line 97 of file CKinFunction.cpp. 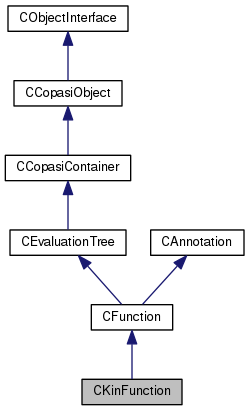 References CFunctionParameters::add(), CCopasiVectorN< CType >::add(), CEvaluationNode::buildInfix(), C_INVALID_INDEX, CFunctionParameters::cleanup(), CCopasiVector< T >::cleanup(), CEvaluationNode::CONSTANT, fatalError, CFunctionParameter::FLOAT64, CCopasiVectorN< CType >::getIndex(), CCopasiObject::getObjectName(), CEvaluationTree::getType(), CFunction::getVariables(), mNodes, CFunctionParameter::MODIFIER, CEvaluationTree::mpNodeList, CEvaluationTree::mpRoot, N_IDENTIFIER, N_KCONSTANT, N_MODIFIER, N_NOP, N_PRODUCT, N_SUBSTRATE, N_VOLUME, CFunctionParameter::PARAMETER, pdelete, CFunctionParameter::PRODUCT, CFunction::setInfix(), CFunctionParameter::setType(), CFunctionParameter::setUsage(), CCopasiVector< T >::size(), CFunctionParameter::SUBSTRATE, and CFunctionParameter::VOLUME. 113 // We need to check that we have no reserved name. 116 "PI", "EXPONENTIALE", "TRUE", "FALSE", "INFINITY", "NAN"
128 // Gepasi but within COPASI. 132 // We have to replace the corresponding CEvaluationNodes to reflect the change. 141 // The Infix has changed we need to update it. Definition at line 246 of file CKinFunction.cpp. Definition at line 52 of file CKinFunction.h. Definition at line 46 of file CKinFunction.h. Referenced by CKinFunction(), cleanupNodes(), createParameters(), and getNodes(). Definition at line 48 of file CKinFunction.h.